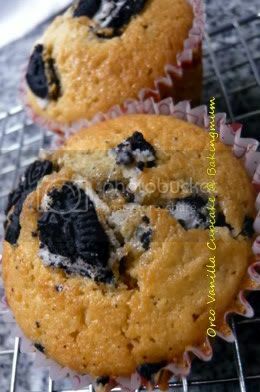 Made these for the boys for breakfast since they like oreo. I have extra for hubby to bring to work too. 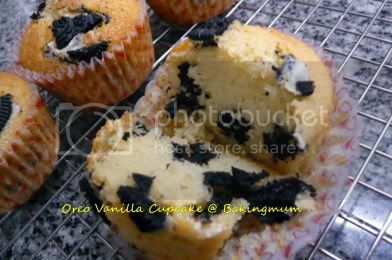 I used my vanilla cupcake recipe and just added some chopped oreo inside the batter as well as on top of the cake. For those of you who would like to try this, switch the quantity of the brown sugar with the castor sugar. Ie to say, lesser castor sugar and more brown sugar. Reason being brown sugar is less sweet as compared to castor sugar because the cream in the oreo is already sweet. Looks yummy! Thanks for the tips. Hi Baking mummy, I have link you to my blog...at http://ahshui-little-kitchen-linkinfo.blogspot.com/ ..thanks a lot. Hi Ah Shui, thanks for linking me. Hi Hillary, you can get the vanilla cupcake recipe under 'Baking'. 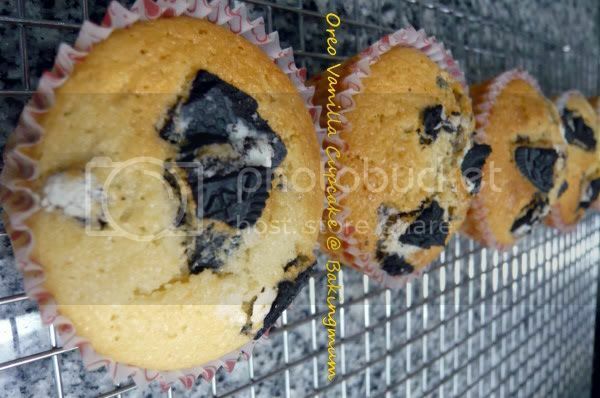 Just need to chopped up some oreo cookies and add it into the cupcakes. Yes you can just add chopped strawberries in place of oreo.